This is a photograph I took of a Golden Eagle in flight overhead. It was hard to be steady enough to take the photograph. This is a photograph of a vertical cloud bursting into the air. I love clouds. This is a shot of Waikiki Beach in Oahu, Hawaii. 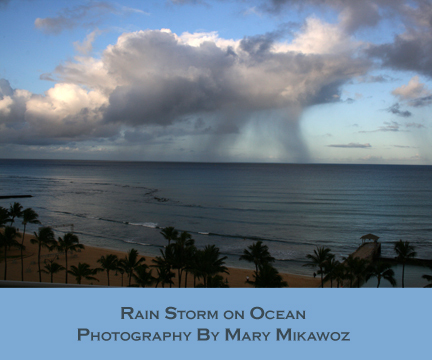 Over the ocean there are storm clouds in the sky and from the bottom, you can see how the rain has started on the ocean. It was very difficult to get any photos as these beaches are almost always full of people swimming and riding the surf. For once, I was able to capture it relatively quiet of people and in the pristine beauty of nature itself. I have always enjoyed seeing rain from a distance. On the prairies you can see the rain storm coming from far away.